I had to upgrade my computer to 10.7. Since this day, the kinect setup which was perfectly working on 10.6.8 doesn't work anymore. The "OSCeleton way" leads to this message on terminal : "Bus error: 10". Synapse.app works (Skeleton is detected + depth image) but if I launch the test QC composition, I have the message "error opening socket, please choose a different port". So, I'm a bit lost... any help, or searching direction, would be greatly appreciated ! Have a great day, thanks by advance ! try installing the zigjs.com browser package it includes open NI and sensor hacks all in one bundle plus libusb etc... as per the socket error that is probably related to a binding overflow of OSC data with qc. are you running the max patch with synapse ? try ni-mate as well. ? the other error is related to the sensor. not entirely sure but have seen it before. after installing zigjs things might be a bit easier or not hard to say all my old patches do not work as the kineme kinect patch isn't working for me anymore. i suppose i can get the depth image from synapse syphon or open cv maybe even vades kinect patch might still be working have not tried that yet. Hello and thank you, Dust ! Indeed, installing zigjs was a good thing to do. Now, kinect is detected and and have no more error messages in the terminal. However, I still have the "socket error" in QC. I tried to listen OSC with OSCulator and it seems data are effectively sent. I will work around with this and give feedback soon (i hope...), thanks again for your help ! sweet, you got it working. i as well got the kineme kinect patch working again. not sure what the issue is with my laptop but installed it on a fresh computer and works like a charm ;) as per your socket error usually in this case what I do is change the OSC port number. it seems sometimes if you continually write the same port things get all bound up and using a new port number usually fixes that for me. I'm not sure if you can change the port number with synapse. In this case a restart may be needed. I have only seen that error in qc a few times and that is normally when I'm using osculator in concatenation with qc built in osc patches. glad to see you got it working. I hope you'll find a solution for you, Dust, as efficient as you did for me ! 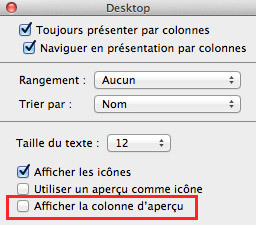 I have deactivated le "preview column" in "desktop display preferences" (i don't know the exact wording in english, see picture). As silly as it seems to be, this made thing better for me... And I confirm that "socket-error" occurred without any QC comp opened before that. I also would like to prevent auto launching of previously opened compositions on QC restart (a very annoying feature from 10.7 in my opinion :-)). A lot of socket-error raised because of "innapropriate multiple launch"... well, it's my "magical interpretation of computer trouble" ! Skeleton is working with both Synapse and OSCeleton, just as new ! I'm on a macbookpro 15" i5 2,4GHz, 10.7.3. What info from me could help you ? please ask if you need. i have been get caught in the lion auto restore window crash thing in lion, which i agree can be a bit annoying overall but has it has saved a few comps that crashed with something cool i wanted to save before. 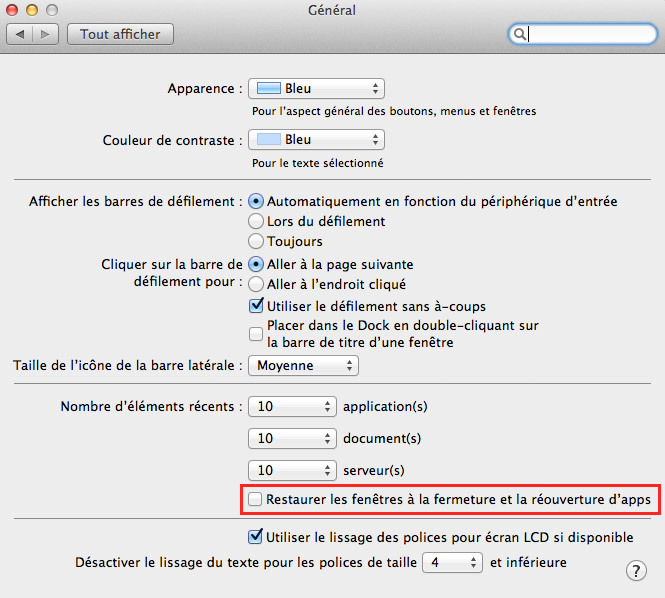 i trash qc preferences from /Home/Library/Preferences/ (trash selected in pict). at this point your preferences for qc will be reset... but lion will still want to restore old windows and gives you an option to restore or not. you do not want to restore windows. thanks, indeed, 10.7 provides the option to inhibit this auto-relaunch behaviour. And it makes things going better for me.